Where Will You Travel on Free National Parks Day? Rent a Disney timeshare in California or an Orlando timeshare now and plan to be part of a great Debut at either Walt Disney World in Florida, or Disneyland Resorts in Anaheim, CA. On October 14, 2010, Duffy the Disney Bear will make his long-anticipated debut at the U.S. Disney Parks. Never heard of Duffy? Well, he made his first official appearance at Tokyo Disneyland where he's become quite a phenomenon. See, what happened was that when Mickey Mouse was getting ready to go on a trip, Minnie knew he would need a traveling companion, so she got him the perfect one - his own teddy bear! And believe it or not, Duffy has actually gotten to be more popular in Japan than even Mickey! But there's no denying who Duffy really belongs to. He has a "hidden Mickey" face shape, Mickey's silhouette is on the bottoms of his feet, and he has a very special birth mark on his hip. In Anaheim Duffy will be introduced at Disney's California Adventure at Paradise Pier. Duffy's debut at WDW will be at a newly created venue inside Epcot across from the Mexico boat ramp. At Epcot the Kidcot program is involved as well. Kidcot Fun Stops are colorful craft stations for preschoolers located in World Showcase at Epcot. On October 14 your youngsters will be able to go to the Kidcot stops and get a unique Duffy that they can take from country to country to color, decorate, and receive country specific Duffy stamps. In both parks, special activities and events will mark the October 14 celebration. 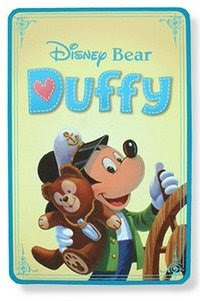 The day will not only introduce the Duffy teddy bear itself, but also other related souvenir items such as key chains, magnets and zip pouches. The launch will also consist of some special treats like Duffy's crispy treat, chocolatey cake, molded dessert cup, a menu placemat with activities, and coming later, Duffy’s very own molded popcorn bucket. Although Duffy is actually a small toy teddy bear that Mickey carries with him, he will now be inducted into the full-size, walk-around, character family. During his daily visits, he’ll dress for the occasion but he'll also frequently be seen in many of his own outfits, including a sailor outfit and a baseball uniform. Disney plans to position the Duffy the Disney Bear as a direct competitor to the popular "Build-a-Bear" franchise. You'll be able to dress Duffy in a full line of costumes, including Christmas and Easter, and for special occasions such as birthdays and graduation. Duffy is a bear of magic and great luck and the perfect traveling companion for your family. Take him along on all of your timeshare rental vacations!